(1) Only bolt assemblies of classes 8.8 and 10.9 conforming to the requirements given in 2.8 Reference Standards: Group 4 for High Strength Structural Bolting with controlled tightening in accordance with the requirements in 2.8 Reference Standards: Group 7 may be used as preloaded bolts. (1) The material properties, dimensions and tolerances of steel rivets should comply with the requirements given in 2.8 Reference Standards: Group 6. - Steel grades used for reinforcing bars conforming to EN 10080, provided that the nominal yield strength does not exceed 640 N/mm2 when the anchor bolts are required to act in shear and not more than 900 N/mm2 otherwise. In this category bolts from class 4.6 up to and including class 10.9 should be used. No preloading and special provisions for contact surfaces are required. The design ultimate shear load should not exceed the design shear resistance, obtained from 3.6, nor the design bearing resistance, obtained from 3.6 and 3.7. In this category preloaded bolts in accordance with 3.1.2(1) should be used. Slip should not occur at the serviceability limit state. The design serviceability shear load should not exceed the design slip resistance, obtained from 3.9. The design ultimate shear load should not exceed the design shear resistance, obtained from 3.6, nor the design bearing resistance, obtained from 3.6 and 3.7. In this category preloaded bolts in accordance with 3.1.2(1) should be used. Slip should not occur at the ultimate limit state. The design ultimate shear load should not exceed the design slip resistance, obtained from 3.9, nor the design bearing resistance, obtained from 3.6 and 3.7. 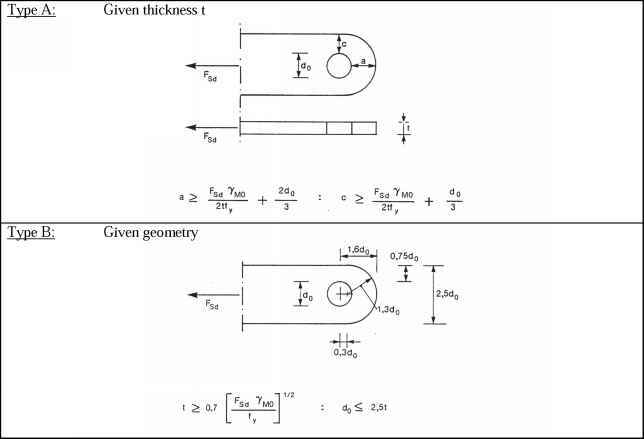 In addition for a connection in tension, the design plastic resistance of the net cross-section at bolt holes Nnet,Rd, (see 6.2 of EN 1993-1-1), should be checked, at the ultimate limit state. The design checks for these connections are summarised in Table 3.2. In this category bolts from class 4.6 up to and including class 10.9 should be used. No preloading is required. This category should not be used where the connections are frequently subjected to variations of tensile loading. However, they may be used in connections designed to resist normal wind loads. In this category preloaded 8.8 and 10.9 bolts with controlled tightening in conformity with 2.8 Reference Standards: Group 7 should be used.